New Shifts hosted their first workshop at the impressive Maersk Training Facility in Dubai in November 2016. This interactive session was aimed at inspiring mid-career professionals to tackle their career change dilemmas with the help of ‘Design Thinking’. Before that, however, attendees were privileged to have access to the top career coaches from the region, who were there to give their perspective and career change advice. Speaker sessions came from established career coaches Staci Collins, Tricia Evans and Caroline Gasc, inspiring our roomful of delegates to move forward and face their greatest career fears head on. With over 28 year’s experience and an impressive client network of 3100+, Staci Collins, connected to the workshop from California, USA, through a tailor-made webinar for New Shifts. 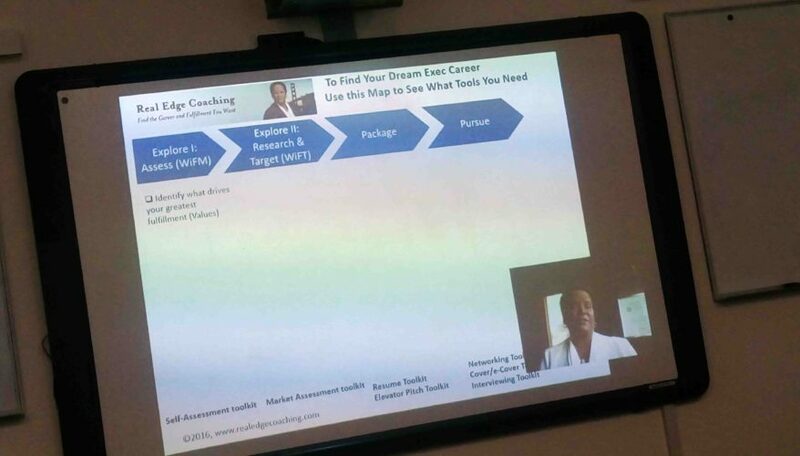 She focused on how to “map your career transition journey”. She described herself as authentic, measurable and inspired and encouraged all the listeners to look for the three keywords they would identify themselves with. 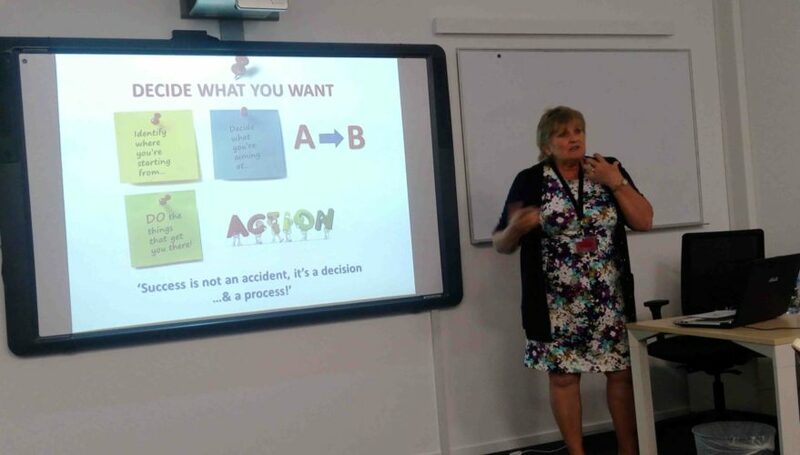 Showcasing examples from her own clients who have successfully undertaken their own inspiring changes, she emphasized the necessity of making a big perspective shift from “what’s in it for me (WIFM)” to what’s in it for them (WIFT)”. During her webinar, she explained what to focus on without losing sight, what hiring managers want to hear from you, how to transform your years of experience into the new industry/function that you target and most importantly that it can be done! 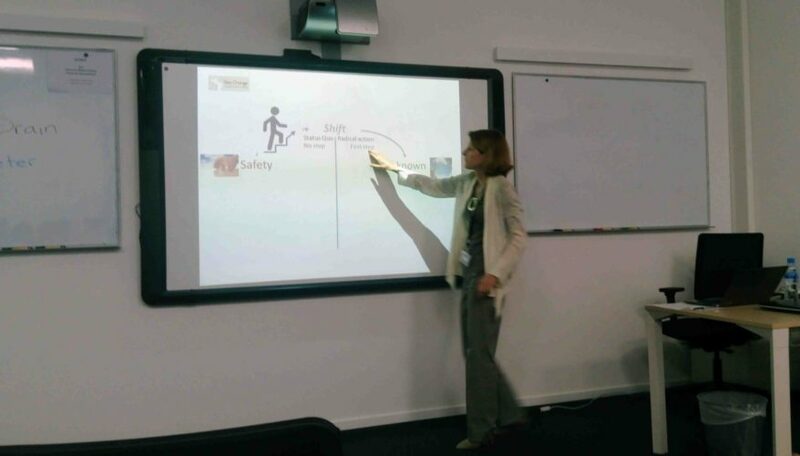 Dubai-based career coach Tricia Evans led her session in person. Tricia has been a career coach since 1993. Having worked with over 6,000 clients, Tricia mainly focuses on how people can be successful whatever they do. She encouraged the delegates to view themselves as multi-faceted diamonds who could use these facets (such as transferable skills and their personality traits) to create their own personal brand. And last, but by no means least, delegates were presented with another perspective from Caroline Gasc, Founder & MD of Sea of Change. For Caroline, the subject of career change is very close to her heart as she is a former CFO turned coach. She specializes in equipping people with strategies to crossover from their comfort zone into the ‘unknown.’ She adeptly weaved in her personal story into her presentation where she narrated how she said goodbye to her career in finance ten years ago and jumped into taking her coaching certification. Caroline also took the delegates through a powerful visualization where they explored the meaning of feeling safe in their ‘status quo’ as well as testing the ‘unknown’ while they kept their eyes closed. After the session, a delegate reported that he was no longer able to return to his safe place after having a taste of adventure that the ‘unknown’ had to offer him, simply as the status quo no longer served him. Feeling inspired? Watch out for the key takeaways from the Design Thinking session and see how you can explore your career transition with our tips and advice that you can put into practice. Don’t hesitate to contact us if you have any questions, and if you ‘d like to attend our next workshop, then sign up here to be the first to know.